Mouse anti Human HLA B27 antibody, clone HLA-ABC-m3 recognizes the HLA-B27 alloantigen. This antibody reacts with the peripheral blood lymphocytes of 47/47 individuals conventionally typed as HLA-B27 + and precipitates cell surface molecules of 43 and 12 kD, corresponding to the HLA Class 1 heavy chain and beta 2 microglobulin.  Affinity studies by Scatchard analysis showed that this antibody has a higher affinity for HLA-B27 (9.7 x 108M-1) than for HLA B7 (9.5 x 107 M-1). Immune complex precipitated from an HLA-B27 positive cell line by anti HLA antibody and staphylococcal protein A. Use 10ul of the suggested working dilution to label 106 cells or 100ul of whole blood. Trapani, J.A. et al. (1983) Description of a mouse monoclonal anti-HLA-B27 antibody HLA-ABC-m3. Hum Immunol. 7 (4): 205-16. Orr, K. et al. (1994) Utilization of commercial antisera and flow cytometry in HLA-B27 typing. Cytometry (Comm. Clin. Cytometry) 18: 17-20. Levering, W.H. et al. (2003) Flow cytometric HLA-B27 screening: cross-reactivity patterns of commercially available anti-HLA-B27 monoclonal antibodies with other HLA-B antigens. Cytometry B Clin Cytom. 54: 28-38. Mandic, R. et al. (2004) Comparison of surface HLA class I levels in squamous cell carcinoma cell lines of the head and neck. Anticancer Res. 24 (2B): 973-9. Goodall, J.C. et al. (2007) Does HLA-B27 influence the monocyte inflammatory response to lipopolysaccharide? Meyer, O. et al. (2006) A simple and practical agglutination assay for human leucocyte antigen-B27 typing. Vox Sang. 91 (1): 77-80. Meyer, O. et al. (2008) Application of the particle gel agglutination assay in the typing of single human leucocyte antigens. Tissue Antigens. 71 (2): 157-9. Marroquin, B. O et al. (2015) HLA-B27-Homodimer-Specific Antibody Modulates the Expansion of Pro-Inflammatory T-Cells in HLA-B27 Transgenic Rats. PLoS One. 10 (6): e0130811.